The Automechanika, held from 9 to 12 December 2014 in Shanghai, is the second largest international exhibition for vehicle parts, accessories and services in the world. More than 4,800 exhibitors from 17 countries and regions presented their products and services to more than 86,000 international visitors. 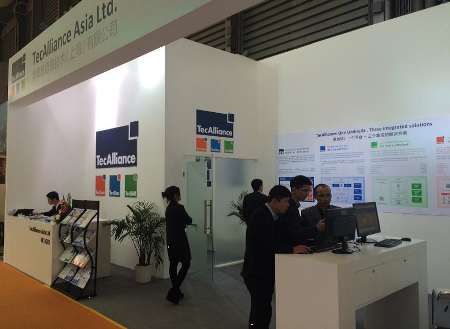 For TecAlliance Asia the appearance at the exhibition was a great success, showing that Automechanika Shanghai is the optimal platform to further expand the business in China and the complete East Asian market. On the TecAlliance exhibition stand visitors learned about how the company acts as a strong alliance of the three brands TecDoc, TecRMI and TecCom to sustainably strengthen the competitive power of the international automotive aftermarket. Above all the TecDoc WEB CATALOG China met with great interest. The data pool that was specially modified to meet the needs of the Chinese market already contains extensive replacement part information from 42 part manufacturers with 70 brands and is being expanded continuously. 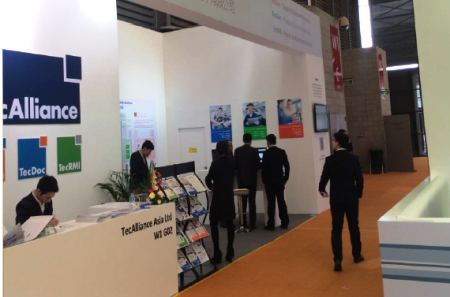 Many visitors came to the stand to see presentations of the TecAlliance solution portfolio and particularly the TecDoc WEB CATALOG China.